The Land of Enchantment has a very storied history, and Native Americans have honored the beauty, majesty, and mystery of New Mexico long before Taos, NM was ever on the map. Ancient Native American ruins are spread throughout New Mexico and, lucky for you, some of the most impressive are down the road from some of the best places to stay in Taos New Mexico. If you are wondering what to do in Taos this spring, set away some time to experience some of the state’s most astounding native ruins. Using El Pueblo Lodge as your home base, check out these three unforgettable historical landmarks. An hour and a half from El Pueblo Lodge (one of the best places to stay in Taos) is Los Alamos and the breathtaking Bandelier National Monument. Sprawling over 33,000 acres of land, this national monument provides the perfect setting for visitors to explore canyon country while also experiencing the relics of this area’s ancient people. 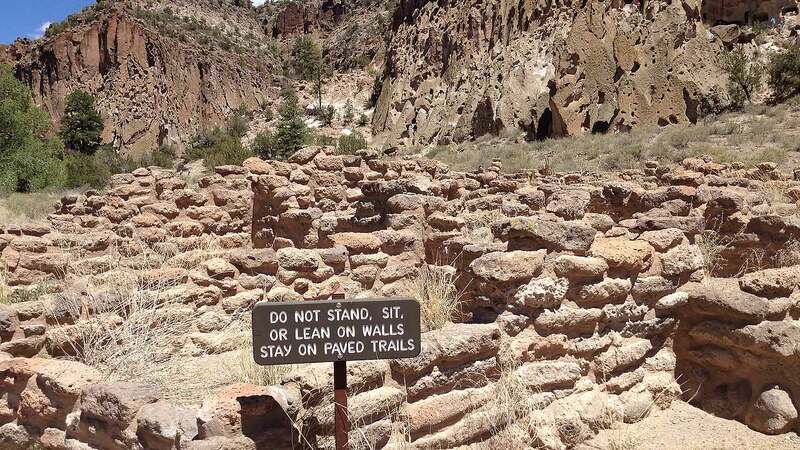 Dating back more than 11,000 years, the petroglyphs, cliff dwellings, and masonry remnants serve as a haunting reminder of a people and lifestyle long gone. In addition, the many trails at Bandelier National Monument expose guests to the flora, fauna, and wide-open expanses that make New Mexico so enchanting. An hour to the south and west of your hotel in Taos New Mexico are the Puye Cliff Dwellings – the ancient home of 1,500 Pueblo Indians dating back to the early 900s AD. This National Historic Landmark provides the perfect place to discover early life in the desert Southwest, learn about American history, and simply enjoy the peace and quiet of beautiful New Mexico. The impressive cliff dwellings, inspiring petroglyphs, and well-preserved structures will leave you completely astounded. Atop the must-see list for any visitor to Taos, New Mexico is the Taos Pueblo, reopening to the public on April 25. This UNESCO World Heritage Site is home to the ancestors of original Pueblo Indians and is one of the most private and conservative pueblos remaining in the U.S. For enquiring visitors however, you can schedule tours and attend various events to get a glimpse at this unique and inspiring culture. If you still find yourself wondering what to do in Taos NM, don’t let a visit to the Taos Pueblo pass you by! Only two miles from El Pueblo Lodge, visiting this remarkable place is a must. New Mexico is home to countless ancient wonders and, for all Taos visitors, many are right out your back door. El Pueblo Lodge is here to serve as the most affordable and comfortable home base for you, as you explore The Land of Enchantment and its historical wonders this spring. Book your stay today!